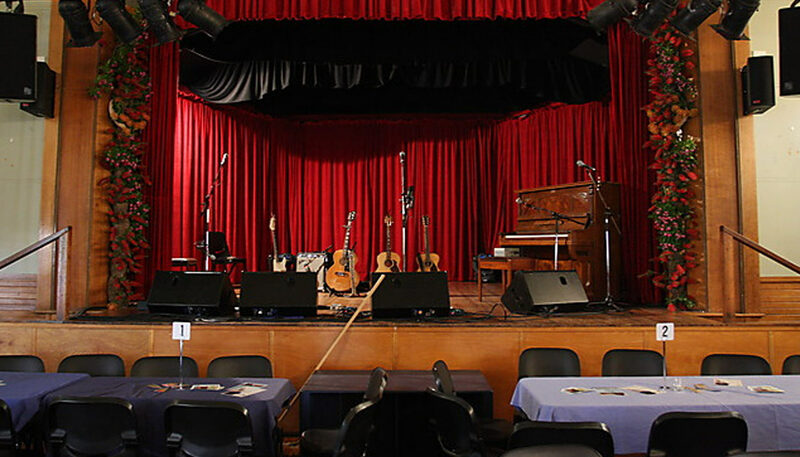 Meeniyan Town Hall is located in the centre of the town of Meeniyan, on the South Gippsland Highway, Victoria. It is approx. 2hrs from the Melbourne CBD. Location: Meeniyan Town Hall is located in the centre of the town of Meeniyan, on the South Gippsland Highway, Victoria. It is approx. 2hrs from the Melbourne CBD. Seating Capacity: 260 The usual format for our events is table and chair seating, table sizes varying from 4 – 12. Most events are BYO drinks and nibbles. Children: Children are welcome to most events and discount prices are available upon application. Stage: Size 8m x 5m. Access at street level, with 4 steps onto stage. Stage elevation: 1metre. meals are served for artists. Please notify in advance of any special dietary requirements. FOH and monitors: Nexo /Turbo Shure beta 58 vocal mic, sennheiser, shure instrument mic. Mann M21 ambience mics.